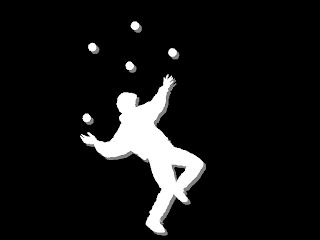 Have you ever watched a juggler begin his act? They start out with a giant smile on their face and two to three balls. As they juggle those balls they hold that smile with ease and steal glances at their audience, making eye contact with various watchers. The act progresses by the juggler tossing those few balls in tricky styles, wowing the crowd. But what really gets the crowd going is when the juggler adds more balls, and more balls...before the eyes of the crowd the juggler is performing what many consider to be the impossible. But what happens to the jugglers face? And what has happened to the eye contact they once had with the audience? Most professional jugglers are quite able to keep a friendly decorum during the most intense times of their acts, but you can see the smile fade to a gentle smile with a lot of concentration behind it, the juggler is no longer able to make glances at the audience because if he were to take his eyes off the ball for a split second tragedy for his act could reign. Now, add the uncertainty and erratic movements of a ball marked "mental illness." It becomes increasingly difficult to smile during our "act" and there is zero chance of interacting with our "audience" because it takes every bit of energy and life force in us to keep those balls in the air. Can you see the picture I am painting? Of course you can. What is the solution though, right? We have all heard the adage "There is strength in numbers", yes? Well, it is true. For those of you who have joined groups you are likely to agree that they can be quite useful. The members of the group help us to gain strength, gain encouragement, and gain accountability. Do we really want to accept something that small as our mastery? Please do not misunderstand me, there will always be days here and there that small mastery is all that is possible, and I accept that. What I am talking about is, regularity. On the regular, what can I expect my mastery to be for that day? Here I am evaluating my abilities and measuring my progress. I do this by looking back at my experiences, looking back at where I have come from. I re-evaluate where I was headed two years ago and I ask myself the tough questions, am I still headed there? Have I reached my goal or did I get lost along the way? What has prevented me from getting as far as I would like to have? What is happening in my life now and is my goal still attainable? Is it reasonable? Groups are a wonderful place for this type of evaluation. So, as I have mentioned, we are re-opening our forum at the beginning of September 2013. We will have weekly group meets where we can share, listen, and learn from one another. I would like to get some feed back on this and maybe get an idea of how many interested ones we may have. Thank-you for reading my fellow jugglers, and I look forward to this site being more of a routine in my life.